Be It Unto Me is the premier image in what we believe will be a major and definitive collective work. Over the next two years, the artist will document the human events in Jesus' life through 50 unique paintings that will be made available over time as prints, canvases, and a book. 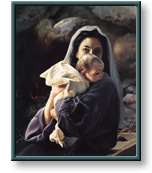 Liz Lemon Swindle sees this image as a celebration of Mary as much as Jesus. "I love the Savior with all my heart and feel a deep connection with Mary. Like her, I was a young mother, 20 when I had my first baby. I remember being in the hospital the first day and laying my son on a blanket, standing back to gaze at him and suddenly feeling terrified. The reality hit me all at once that this fragile new life depended wholly on me. The intensity of my feelings, the awe and love I was experiencing, brought me to tears. "Mary was much younger than I — about 14 years old, just a child, when the angel came and revealed her destiny to her. According to the laws of the time, a woman could be put to death for becoming pregnant before marriage. But all Mary could say when faced with this enormous responsibility, this great weight, was 'Be it unto me.' You have to honor someone with that kind of faith." Matted Size: 10" x 8"
This 7" x 5" print is matted. A 7" x 5" print comes matted and framed. Glass included. Image Size: 22" x 18.5"
Image Size: 22" x 18 1/2"
Be It Unto Me copyright© 2000 by Liz Lemon Swindle is prohibited from being copied.